Zinc sill plate set for the 1928-31 Coupe. Henry used a solid zinc sill plate on the tudor sedan and these are a really nice authentic set. Aluminium sill plates for the 1928-31 Coupe. Set of 2. This is a lower priced aluminium sill plate set for the 1928-31 Tudor sedan. Set of 2. Zinc sill plate set for the 1928-31 Tudor Sedan. Set of 4 screws for mounting the Model A Ford Coupe or Tudor sedan sill plates. You will need 2 sets for a Tudor sedan. Made in USA. Set of 40 sill plate screws to secure all of the Model A Ford sill plates and fixtures. Made in USA. 1928-29 Roadster Pick-up Sill Plate Set. Made in USA. Set of 2. 1930-31 Plain Murray Sill Plate Set. These are for the 30-1 Murray 4-door Sedans. Thesde are the plain style although most cars had the etched ones. Come in sets for front and back. Made in USA. 1930-31 Etched Murray Sill Plate Set These are for the 30-1 Murray 4-door Sedans. Most cars had the etched ones. Come in sets for front and back. Made in USA. 1931 Slant Windshield 4-door Sill Plate Set . This set is for the front and rear. Made in USA. 1930-31 Victoria Sill Plate Set . Beautifully etched just like the originals. Set of 2. Made in USA. 1928-29 Briggs Sill Plate Set. They are for the Briggs 4-door Sedans only. Set of 4. 1929-31 Etched Briggs Sill Plate Set. They are for the Briggs 4-door Sedans only. Set of 4. Model A Ford Cabriolet 68-A and 68-B sill plate set. Exact duplicates for the 1929 and 1930 Cabriolet. Set of 2. 1931 Cabriolet Sill Plate Set . Exact duplicates for the 1931 Cabriolet 68C with the slant windsheild. Set of 2. 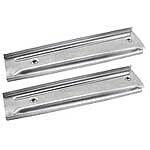 1928-29 Roadster/Phaeton Front Sill Plate Set. Exact duplicate of the original. Set of 2. Made in USA. 1928-29 Phaeton Rear Sill Set . Made with the Ford script in the proper place. You may have to do some adjustment to fit them in properly. 1928-29 Phaeton Sill Plate Extension Set. Used on the rear of the 1928-29 Phaeton. These little extensions go between the rear seat riser, and the side of the body. The upholstery panel will set down in these. Set of 2. Made in USA.